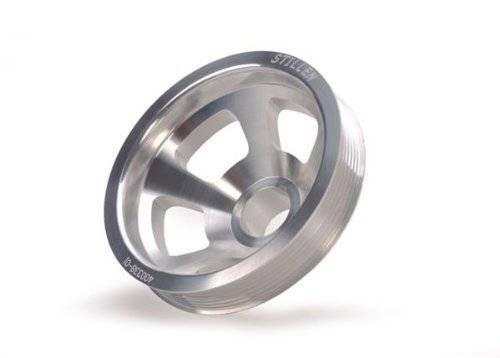 Each pulley is machined from 6061 aerospace grade billet aluminum with a bold new design to maximize performance, strength and minimum weight. 304 stainless steel sleeves are used for main seal contact points for durability. Stock timing marks are maintained and keyways are precision broached. All pulleys are CNC turned, milled and balanced based on computer generated designs. Up to 80% lighter weight than stock steel and up to 10% lighter than other aftermarket pulleys, we’ve seen power gains of up to 10+ HP at the wheels.